The approximately 230-acre campus in Okmulgee is just 40 miles south of Tulsa in east central Oklahoma. From Tulsa: Head south on US-75 toward Glenpool and Okmulgee. From OKC: Head east on Interstate 40 and take the exit for US-75 north in Henryetta. From Fort Smith, Ark: Head west on Interstate 40 and take the exit for US-75 north in Henryetta. For detailed map directions, use your favorite map service or search us on Google Maps. This map shows an overhead, aerial view of the campus and allows users to view building names by category. Viewing the map requires Adobe Reader. Ready to see the campus first hand? Visit us in Okmulgee. It’s the best way to experience OSU Institute of Technology. Get an up-close look at the facilities, visit with current students and meet faculty and staff in the programs and departments that interest you. All campus tours begin at 10 a.m. Monday through Friday. Everyone must be pre-registered for a campus tour. Register for a tour today. Groups of 10 or more students can register ahead of time. Please give two weeks advance notice. 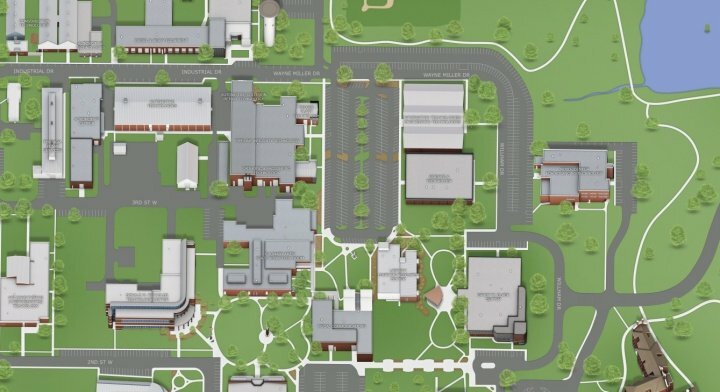 This responsive, mobile-friendly 3D map provides an aerial view of the campus and allows users to view buildings by category. If you're unable to attend a scheduled tour, we offer a self-guided option that you can complete at your convenience.